An event occurred in the Ground Forces, the significance of which is difficult to overestimate. Entered into force a new set of combat regulations (BU). Traditionally, it includes three books. Part one covers the actions of the regiment, division, brigade. This document is secret. The second part is devoted to the battalion company. The third - platoon, branch, tank. Formally, BU is still considered temporary. But this should not be confusing. For example, before the formation of the Rosguards, the combat regulations of the internal troops of the Ministry of Internal Affairs of the Russian Federation were also temporary. The new ground forces of the Ground Forces were approved in September last year. But they began to enter the troops only in the present. It is noteworthy that the documents were distributed mainly in electronic form, through the "military Internet" - a closed segment of data transmission. In the army, the new military units have already been called revolutionary. One of the officers-interlocutors of the “Military-Industrial Courier” even joked, as if saying, after reading the BU: “This is not the charter of my Armed Forces”. The recognition underlines how seriously the document has changed the tactics of actions of the combined-arms units and subunits. Traditionally, the smallest in terms of information is the combat regulations governing the actions of a squad, platoon, and tank. But in the new edition, the third part became equal in volume to the second. Since the beginning of the 2000s, in the Ground Forces, three sets of controllers have changed. These documents became a good marker of the reforms that were taking place in the Armed Forces. Until 2005, the Russian combined-arms units, units and formations fought according to the combat documents approved in the Soviet Union. But they did not take into account the experience gained by Russian motorized riflemen and tankmen in local conflicts on the territory of the former USSR and in two Chechen campaigns. The main tactical method of motorized rifle platoons and squadrons in the BU-1989 was the combat line. The actions of the fighters in pairs, threes or fours were not prescribed. Although at the time of writing the control unit, these tactical techniques had already been mastered during the war in Afghanistan. Attempts to solve the problem have become BU 2005. Formally, the entire set of combat documents was entered by one order, but the troops received irregular regulations. Even before their approval, the 42nd Guards Motorized Rifle Division in Chechnya received the first kits. In other parts and connections, the statutes came only in 2006. And at first it was only the second part. Six months later, the first one began to arrive. And “Platoon, secession, tank” massively went to the troops only in 2007–2008. Although by this point the development of new combat documents had already begun. Tactical techniques in the BU-2005 have changed slightly. Added chapters on the participation of units, parts and connections in local conflicts. But by and large, the additions were declarative in nature. It outlined the tasks of platoons, companies, battalions, regiments and divisions during armed conflicts. The main tactical actions were search and reconnaissance, as well as service at checkpoints (checkpoints). Work on the next set of BU took almost six years. Moreover, already in the process of signing these documents changed significantly several times. Work began simultaneously with the new look, the reform of Anatoly Serdyukov. And all tactical techniques were developed under the newly formed motorized rifle and tank brigades. Part of the “Brigade, Division, Regiment” was especially hard. Indeed, in the course of the reform, the second and third were reduced, giving their places to brigades. The first temporary statutes for parts and connections of the new look were ready in 2011. But the troops received only for reference. In fact, the ground forces continued to "fight" according to documents of the 2005 sample. In 2012, Sergei Shoigu replaced Anatoly Serdyukov as defense minister. The reform of the new look was curtailed. Other transformations began in the Armed Forces. Therefore, the set of BU had to be redone once again. Regiments and divisions returned to the place of brigades. Finally, the BOO package was approved in 2014. In these documents, for the first time, separate articles appeared on the actions of sniper pairs. For a long time the question remained problematic for the Ground Forces. Previously, snipers were part of motorized rifle platoons and branches and reported directly to the unit commander. Later snipers brought in separate rifle companies, subordinating directly to the brigade commander. At the time of the fighting platoons snipers attached to the infantry battalion. Why, three years later, did the military regulations again have to be changed? The answer is obvious. New documents were created taking into account the experience of operations in Syria. This becomes clear even after a superficial acquaintance with the combat documents. For the obvious reason, we are considering the third and second parts of the BU SV, which do not have a secrecy bar. The tendency to expand the tactics of actions of branches and platoons was outlined in the charters of 2005 and 2014. But in the BU-2017, new tactics found a logical conclusion. In the new edition, the branch is divided into maneuverable and fire groups. The first destroys the enemy in melee, using decisive action and maneuver. The second supports her with fire. The maneuverable group consists of three arrows (one - senior). A machine gunner, the number of calculation, the grenade launcher and his assistant form a fire group. For the first time, the formation of groups on the basis of branches was formulated in the manual "The system of armed struggle at the tactical level." The training manual was released in the late 2000s. In the course of the exercises and practical exercises, the actions of the groups proved their expediency. But only now these norms are fixed in combat regulations. Several articles describe the order of actions of groups during the assault and stripping fortifications. It is noteworthy that in the BU-2017 the norm was preserved, that in the case of tactical necessity, the separation can operate in the shooting line. The battle order of the motorized rifle platoon also underwent major changes. In particular, it now also includes several groups: command, fire support, and combat vehicles. The first includes the squad leader, his combat vehicle and signalmen. The second is the platoon-supplied fire weapons — anti-tank missile systems and automatic grenade launchers. In general, the BU-2017 pays special attention to the actions of MSW with attached fire weapons. The group of combat vehicles is a very interesting novelty. If necessary, the platoon commander takes them from the units, forming a kind of reserve. He can provide support to the upcoming units with fire and maneuver. And in defense will help prevent its breakthrough. The companies and battalions according to the new combat regulations form the so-called fire ambushes. Their task is to knock out the maximum number of military equipment and personnel. This is achieved by dagger fire and mine-explosive barriers. A motorized rifle squad or a platoon may be ambushed. They are reinforced by flamethrowers, sapper units, as well as sets for installing a remote minefield. In addition to the platoon (squad), the fire ambush includes several groups: distraction (the first opens fire and distracts the enemy), cover (protects the main forces when leaving the battlefield and withdrawing) and cut off (prohibits the approach to the ambush site). Great attention is paid to the new statutes of the fighting in urban environments. And if before these chapters were written on the basis of the lessons of the Great Patriotic War, then in BU-2017 fights in the cities of Syria are clearly visible. In particular, the experience of the Middle East is clearly visible in the articles on the creation of strong points. This is a longline arrangement of the offices (one per floor). Each tier is responsible for hitting targets at a certain distance from the reference point. The higher, the farther the attack zone. When creating a “opornika” it is recommended to set unnecessary windows. With the help of bricks, you can create loopholes and protection. It is recommended to place a mortar on the roof. And special attention should be paid to communications and underground passages. It is noteworthy that the stronghold may be outside the building. In this case it is necessary to create barricades. The stronghold itself should block the streets and roads, departures from the squares of parks and squares. During the offensive in the city, motorized rifle platoons are divided into maneuverable and firing groups. Each group is assigned its own side of the street. Behind there are tanks and combat vehicles. They provide fire support. For the first time in the military regulations articles appeared on how to act when storming the premises. In BU-2017, the participation of units in internal armed conflicts has been seriously revised. Formally, "common front" solve all the same tasks. They carry out blocking of areas, conduct reconnaissance and search actions, serve at roadblocks. But tactics changed completely. In particular, reconnaissance and search actions are carried out according to a complex algorithm. Several lines are being formed, foot patrols, inspection teams and covers are distinguished. Complicated and the system of duty at checkpoints. In fact, PPC turned into a mini-fortress. Their task is to prevent the free movement of militants, block the terrain and ensure the protection of important objects. A motorized rifle platoon is enhanced by a sniper pair, and a company by a sniper group. Formally, the pair (group) submits to the platoon (company) commander. But the general military commanders do not lead snipers. They indicate the area, orient in the order of action units, note the places and objects that should be paid special attention. The commander also tells the fighters of the pair (group) a password and a recall. Next snipers act independently. They create a base where they rest and prepare for combat work. Themselves form the main and spare firing positions. The task of snipers is to destroy important targets: commanders, calculations of anti-tank missiles, machine-gunners, grenade throwers and, note, drones. It is noteworthy that, as an important component of the work of snipers, the developers of the charters noted the psychological impact on the enemy, who knows that high-precision arrows are operating in the area. Quite interestingly described the work of sniper pairs (groups). As you know, today we do not have divisions on the first and second issues. Therefore, during combat work, one of the snipers is appointed by the spotter. At the same time he works with one or two, and sometimes three snipers. After a while, the spotter changes. The main assessment of the new BU is the reviews of military personnel about them. It's no wonder they say that every line in the statute is written in blood. All the officers interviewed by the “Military-Industrial Courier” noted that the new charter was a very important and competent document. For the first time, the most modern combat experience is reflected in the BU, as well as current trends in the development of the art of war. The following link is to a British updated view of the Russian Art of War. Interesting read especially to those who have studied the old FSU version and those modifications since over the past 4 decades ... long, detailed but informative. Enjoy and may you all have a happy and successful New Year! As the Department of Information and Mass Communications of the Ministry of Defense of the Russian Federation reported on January 22, 2019, from January 22 to 24, 2019, a team of inspectors from Spain, in the framework of the Vienna Document 2011 on confidence- and security-building measures, will assess the military facility in the Russian Federation. This was announced by the head of the Russian National Center for Reducing Nuclear Hazard Sergey Ryzhkov. The Spanish side identified as the object of the visit the 11th separate tank regiment of the Western Military District, located in the town of Gusev, Kaliningrad Region. The purpose of the visit is to check the information provided earlier by the Russian side about the military forces and plans to deploy the main weapons systems and military equipment of this regiment. The inspectors will be provided, as provided for by the provisions of the Vienna Document, information about the unit, as well as the opportunity to become familiar with the main systems of armaments and military equipment of the regiment. Comment bmpd. The formation of the 11th Army Corps of the Coastal Forces of the Baltic Fleet stationed in the Kaliningrad Region of the Baltic Fleet has already been reported. Presumably, the said 11th separate tank regiment is deployed from the separate tank battalion formed earlier as part of the 11th army corps. Recall that after massive cuts in the Kaliningrad region during the reformation of the “New Look” in 2009-2010, only one tank battalion remained in the region as part of the 79th Guards Separate Motorized Rifle Brigade (40 tanks). Accordingly, the bulk of heavy weapons, including tanks, were removed from the territory of the Kaliningrad region — for example, the number of tanks was reduced from 803 to the indicated 40 units. Now the deployment of a new separate tank battalion, and then a new separate tank regiment as part of the 11th Army Corps of the Coastal Forces of the Baltic Fleet, thus means a relatively substantial build-up of a tank fleet in the area. On January 11, 2019, the Ministry of Defense of the Russian Federation reported that "more than 30 T-72B tanks have entered service for the army corps of the Baltic Fleet." “The tanks are equipped with modern powerful rocket-cannon armament, the newest communication means and effective fire control systems. The machine is equipped with a mounted dynamic protection, an engine with a capacity of 840 horsepower, a set of guided weapons with laser aiming at the target,” the message says. as you can understand, tanks are not upgraded). "This year, another batch consisting of 30 tanks is expected to enter the tank divisions of the army corps." It is possible that the formation of the 11th Separate Tank Regiment is a prerequisite for the formation of a motorized rifle division towards the Kaliningrad Region. Note: had also seen mention recently that this would be called the 20th Tank regiment. In addition there are 3 new Engineer Regiments supporting the 1st, 2nd and 20th Armies along with the Naval Engineer battalion in the Northern Fleet being upgraded to a Regiment. The 152nd Logistic (MTO) brigade was also formed to support the 20th Army. As reported on February 4, 2019, the newspaper AiF-Ural in the material “Plans for the reform of the army were announced, the Central Military District will be divided. In accordance with the new military-administrative structure of the Armed Forces disaggregation of the military districts of Russia. According to AiF-Ural information from a source in military circles, three out of four military administrative units will undergo reorganization. In particular, the Central Military District, headquartered in Yekaterinburg, will be divided. It is planned that during 2019 the territory from Omsk to Irkutsk, which is also part of the Eastern Military District, will be derived from it. Our plans for restoring the 19th motorized rifle division as part of the 58th combined arms army of the Southern Military District have already been reported. A letter from Colonel-General A. Dvornikov, Commander of the Southern Military District of the Russian Defense Ministry, asking the military department to use the land plot on the territory of the Sunzhensky district of the Republic of Ingushetia for more than 8.5 thousand hectares to accommodate a motorized rifle regiment and a division landfill for unlimited use, caused serious public concern and population of the region. The 19th motorized rifle brigade will again become the 503rd motorized rifle regiment, the 4th military base will be the 693rd motorized rifle regiment, and the 135th motorized rifle regiment will be restored in Ingushetia. Shoigu told the generals what war they need to prepare for. According to the Department of Information and Mass Communications of the Ministry of Defense of the Russian Federation, on February 27, 2019, a regular meeting of the Board of the Ministry of Defense of the Russian Federation was held in Moscow under the leadership of the head of the military department General of the Army Sergei Shoigu. “At the same time, the United States is seeking to retain the positions of the superpower, manipulate international law, persistently strive to change the existing conventional arms control regime in Europe in its favor, and also make it difficult for Russia to use its rights under the Open Skies Treaty,” the Minister of Defense said. He also paid special attention to the fact that the development of the forward-based system of the North Atlantic bloc in the Baltic countries, Eastern and Southern Europe continues. Already more than 200 crews from 13 countries of the alliance have acquired the skills of flying over the territory of the Baltic and the Baltic Sea. The scale and intensity of the exercise has more than doubled, in which Ukraine and Georgia, which are not members of NATO, are becoming increasingly involved. Such actions destroy the existing security system in the world. “In such a situation, we are forced to respond adequately, combining strategic deterrence measures with a planned increase in the combat capabilities of the formations and military units,” the Minister of Defense emphasized. - Specific figures and facts were given regarding the work being done in this direction. - The combat structure of the troops and their home base are being improved. - The share of modern weapons in the Western Military District –– up to 54%, in the South –– up to 60%, in the East –– up to 51%. In accordance with the approved Action Plan in 2019, in the Western Military District, the main efforts will be focused on the implementation of 142 organizational measures, the main of which are the formation of a mobile reserve anti-aircraft missile regiment (the effectiveness of covering military and government facilities in the Baltic operational direction will increase by 40%) a tank regiment in the Baltic Fleet, two regiments in the 20th Army, a district technical missile base, a coastal missile division in the Baltic Fleet, the completion of cantonments to the newly formed 3rd and the 144th motorized rifle divisions of the 20th Army, maintaining combat readiness and combat capability of 23 battalion tactical groups. As part of the State Armaments Program, 1,272 units of weapons, military and special equipment will go to the district troops. The training of the Armed Forces of Russia and Belarus "Union Shield - 2019" and a special exercise with the Collective Rapid Reaction Forces of the CSTO "Interaction - 2019" have moved into the active phase. For their successful implementation, 3079 operational and combat training events were planned. The head of the Russian military department once again reminded that the “Union Shield - 2019” doctrine is planned, exclusively defensive in nature and is not directed against third countries. Such exercises are held every two years based on the decision of the presidents of Russia and Belarus. In the Southern Military District, it is envisaged to hold more than 30 main organizational measures, including the formation of a missile brigade, two regiments, a missile division of the coastal missile complex "Ball", and a Center for Ensuring Mobilization Deployment. The formations and military units will receive more than 1,200 units of new and modernized equipment, with the result that the share of modern samples will increase to 66%, and the combat capabilities of the district will increase by 1.3 times. By the end of the year, more than 450 objects will be built and transferred to the troops. In the Eastern Military District, the main efforts are focused on the implementation of 56 organizational measures, the main ones being the formation of the management of a mixed aviation division, an anti-aircraft missile brigade (the effectiveness of air defense in the Amur-Sakhalin direction will increase by 15%) ". By the end of the year, 26 battalion tactical groups will be contained in the district troops. As part of the State Armaments Program, 1,744 units of weapons, military and special equipment for re-equipment of 139 formations and military units will go to the district troops. As the Minister of Defense noted, the Armed Forces are not only actively engaged in combat training, but also participate in the aftermath of natural emergencies. Thus, at the direction of the President of the Russian Federation, from January 11 to February 12, army units carried out clearing the bed of the Bureya River, which was blocked as a result of the descent of a rocky massif. The work was carried out in difficult climatic conditions with the complete absence of transport infrastructure and a considerable distance from livelihoods. The total volume of rock production was about 470 thousand cubic meters. “Without exaggeration, we can say that the operation to move such a volume of rocks in such a short period of time is unique,” ​​the Minister of Defense emphasized. As a result, the threat has now been completely eliminated for the settlements of the Khabarovsk Territory, where about 700 people live, as well as for the automobile and railway communications of BAM. Bureyskaya HPP has restored storage capacity. In connection with the beginning of floods in the near future, Sergei Shoigu instructed the commander of the military districts and the Northern Fleet to monitor the evolving situation, in cooperation with the relevant structures, to assist regional and local authorities. As for the meeting’s agenda, at the proposal of the Minister of Defense, issues related to the implementation of the plans of the Western, Southern and Eastern Military Districts regarding the implementation of the May decrees of the President of Russia in 2012 and 2018, his instructions following the meetings in Sochi, as well as Messages to the Federal Assembly. Commanders reported on the implementation of the plans for the activities of the troops of the Western, Southern and Eastern military districts. The board of the Armed Forces, representatives of state authorities and public organizations took part in the meeting of the Board. Lieutenant-General Gennady ZHIDKO, commander of the troops of the Eastern Military District, in the article “Objectives — large-scale, mood-fighting” in the newspaper Krasnaya Zvezda (No. 26 of 11 March 2019), among other things, said: “By 1 December last year The Eastern Military District formed a motorized rifle division, and with the start of a new training period, its units began training in combat training at county training grounds in the Primorye Territory. " The decision to revive the 127th Red Banner Order of the Kutuzov Motorized Rifle Division (until 2009 the 127th machine-gun and artillery division) was announced on May 25, 2018 at the board of the Ministry of Defense of the Russian Federation. According to the information on the page "SERGEVKA. Military unit 44980 (127 MSD)" in the social network "VKontakte", the division headquarters and one of the motorized rifle regiments are formed on the basis of the 59th motorized rifle brigade [rural settlement of Sergeevka, Primorsky Krai]. 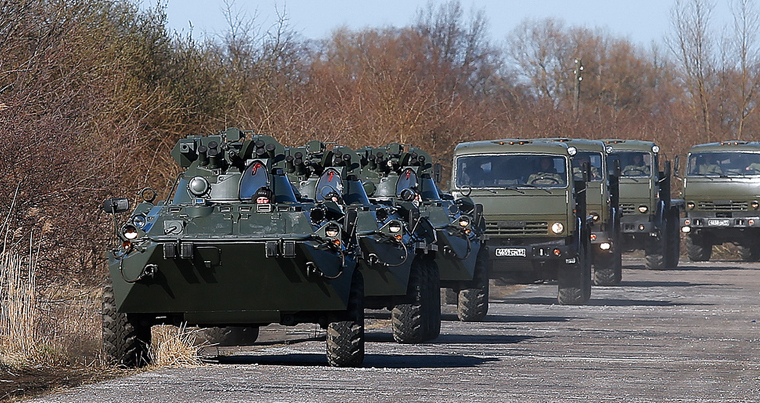 Supposedly, another motorized rifle regiment is formed on the basis of the 60th motorized rifle brigade. In November 2009, the 59th and 60th motorized rifle brigades were created on the basis of parts of the disbanded 127th machine-gun and artillery division. Russian Defense Minister General of the Army Sergei Shoigu took part in an enlarged meeting of the Committee on the Defense of the State Duma. The head of the military department informed the meeting in detail about the results of a large-scale six-year work to strengthen the defense capability of the Russian state by increasing the combat power of our Armed Forces. In fact, Russia now has a completely different army compared to the one that was until 2013. Full translation of the speech by Minister Shoigu. First quarter 2019 unit facilities construction and development.